This extra tall Polycarbonate greenhouse from Waltons is built with value in mind. It is built on a robust aluminium frame and it comes packed with a whole range of impressive features. Not only is the frame incredibly strong, but it also benefits from a green finish, giving the greenhouse a more attractive design. To ensure your plants receive maximum lighting, the building comes with twin wall polycarbonate glazing. This is a lot safer than glass as it is 100% shatterproof. Unlike a lot of greenhouses, it also comes with a sliding door. This gives you extremely easy access and ensures there is no risk of the door blowing closed on you as you’re trying to transport items in and out of the greenhouse. There are a few features that really help it to stand out from the competition including integrated guttering and an opening roof vent. The vent lets you better regulate the temperature inside the building, whereas the guttering helps you to collect rainwater during the hotter, drier months. For peace of mind, this model also comes with a 5 year guarantee. 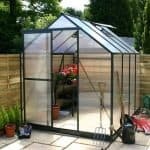 Being one of the larger greenhouses on the market, this would suit those looking to store wheelbarrows and other gardening equipment, as well as a place to grow their plants and produce. Assembly isn’t as easy as you might think. It will take at least an afternoon to put together. This is a traditional looking, extra tall greenhouse with a stylish twist, suitable for growing climbing plants and storing tall equipment. Its impressive roof height also makes this extremely comfortable to use. Interestingly there are no specifications shown for the width of the door. As it’s a sliding door you will benefit from more, uninterrupted access in and out of the greenhouse, with no risk of it blowing closed. 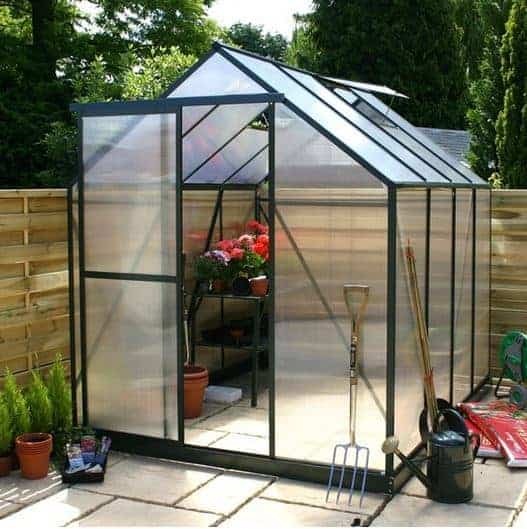 It is one of the larger greenhouses on the market so it is ideal for those who do a lot of gardening. The roof is fully glazed with polycarbonate and there is an opening roof vent added for temperature regulation. It measures 4mm thick, just like the glazed walls and the fact it is fully glazed means your plants and flowers will have maximum light all year round. It has an apex design so rainwater will run right off the roof without causing a build-up. This also significantly boosts its height. There is no floor included with this greenhouse. This makes it vital for you to build it on top of a firm base such as paving slabs or concrete. What we like about this design is you can store heavier equipment such as big bags of compost and boxes, without worrying about damaging the floor. It is also a good longevity benefit too as water spills from watering the plants or spilled soil could damage a wooden floor. The greenhouse comes with polycarbonate glazed twin walls. This measures 4mm thick, which is the equivalent of single glazing. This doesn’t just make it hard to break, it also adds to the insulation of the building. It is built on top of a stable, thick aluminium framework which is highly resistant to rust. This frame has also been given a green powder coat finish, making it look a lot more attractive than your average greenhouse. Whilst it doesn’t come with a floor, it does come with a free steel base. This gives you a strong platform to build the greenhouse on top of and it is also maintenance free. No treatments are required like they are with wooden models and a 5 year warranty is also included. A sliding door is added to the greenhouse for convenience. It also acts as a great space saving measure. What we like about the sliding door is there isn’t a risk of it blowing shut as you’re trying to get in and out. This is especially useful if you’re transporting large plants and equipment. As mentioned earlier, this greenhouse is fully glazed. So you don’t need to worry about whether enough light will be able to enter the building. There is no security added to the greenhouse and there isn’t a lot you can do to improve this. Therefore we definitely advise against storing anything valuable in here. The strength of the glazing makes it difficult to break and the styrene glazing makes it much safer than glass models. 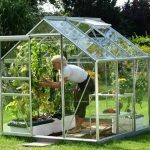 So if you have pets or children, this would be a good, safe greenhouse to invest in. There are two extra options available to you here. These include a Lifestyle Greenhouse Gas Heater and a Greenhouse Rainwater Kit. As a free rainwater kit is already provided, there really isn’t any need to invest in another one unless you want to collect water from both ends of the greenhouse. The kit comprises of a small pipe which funnels the rainwater down and into a barrel or container below it (not supplied). This is a very useful kit for the keen gardener as it allows you to collect water during the drier months, cutting down your mains water use whilst helping your plants to thrive. It’s great for the environment and as it’s free this really adds to the building’s overall value for money. The heater is great for the winter months. If you’re growing plants which require a warm climate, the Lifestyle Greenhouse Gas Heater comes complete with a regulator and hose. It is controlled thermostatically and is economically friendly. At 1.9kw, it is very affordable to run and will ensure the cold weather doesn’t threaten the survival of your plants. This has a very tough design and is built from top quality materials. It has an impressive look thanks to the powder green coating and its quality really cannot be faulted. 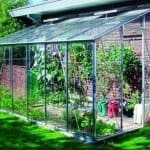 As the greenhouse requires zero maintenance and it is built with a tough aluminium frame, its longevity is fantastic. A 5 year warranty is also included. The space inside the greenhouse is large enough to accommodate a lot of different plants and flowers. Therefore it is recommended for the experienced gardener. If you’re planning on growing a lot of plants then this is definitely suitable. 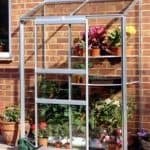 As the greenhouse is advertised as being quick and simple to install, we feel a little let down by the length of time it apparently takes to put together. Customers have reported that the instructions aren’t overly clear and it takes a good amount of time to assemble. It is also advised that you attach stabiliser bars before installing the glass. 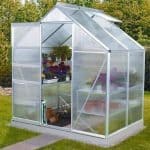 This great greenhouse definitely provides excellent value for money. Its longevity is fantastic, it requires absolutely no maintenance and it provides a brilliant amount of growing space. Final Thoughts: There are a lot of different types of greenhouses available and this in our view, is one of the best. Offering a superb range of features, this spacious building is designed with an extra tall design. That means it isn’t just really comfortable to use, but it can also accommodate large, climbing plants. The twin wall polycarbonate glazing is supported by a very sturdy and durable aluminium frame. We like its green powder coat finish and the fact it benefits from a sliding door is also fantastic. All in all this greenhouse gives you awesome value for money and comes complete with a 5 year guarantee.